Today marks the one year anniversary of David Bowie leaving for the stars. There is little else to be written about that really. So much has been said already, and we certainly don’t have anything original to add. It’s a shame, though, because we really liked him. A witty, original, and interesting bloke was lost from all of us. 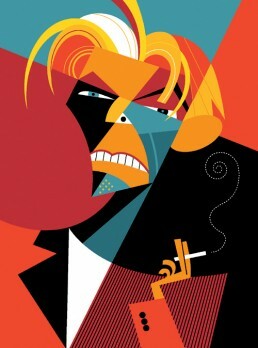 Pablo Lobato creates lovely cubist illustrations of instantly recognisable public figures. We love this one of David Bowie, and highly recommend a shopping trip through his Bēhance store.